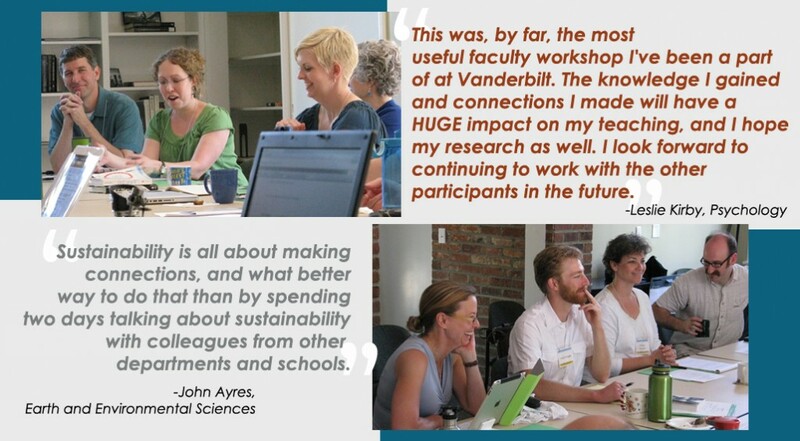 Over the last decade, many universities have sought to encourage innovations in sustainability education by providing educators intensive workshop opportunities to (re)design courses with significant environmental or sustainability components. Modeled on Emory University’s Piedmont Project and Northern Arizona University’s Ponderosa Project, the Cumberland Project has taken various forms but is intended as a workshop resource for vibrant teaching and learning communities around sustainability themes. Emphasis has been given to a wide array of environmental studies across the natural sciences, social sciences, and humanities. The Cumberland Project, in its past iteration, was part of a larger effort at Vanderbilt University entitled the Sustainability Project, an effort to create a campus-wide conversation that endeavored to both deepen understandings of and commitments to sustainability. This involved various programs: the coordination of courses on sustainability, a conference on sustainability, experiential learning experiences via “road trips” focused on different dimensions of sustainability, as well as a documentary film series and other artistic projects on sustainability with the Departments of Art and Film Studies and the Program in Creative Writing. The Sustainability Project was funded with generous support from the College of Arts and Science Fant Fund. The Cumberland Project today focuses on a year-long learning community on sustainability education and course design with the support of the Program of Environmental and Sustainability Studies. If you are interested in sustainability education, please use this website and the many resources it provides, and please seek out consultations with Vanderbilt’s Center for Teaching.